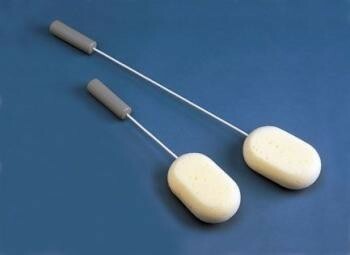 These long handled sponges and pads are mounted on plastic coated wire to allow the legs, feet and back to be reached. These long handled sponges and pads are mounted on plastic coated wire to allow the legs, feet and back to be reached.The wire is flexible enough to bend to any shape to make reaching easier. The sponges are available in two lengths. The luxury double thickness sheepskin pad with a plastic built up handgrip that can be bent to any angle required are suitable for washing or powdering and the flat wire frame covered in a white towelling pad are suitable for washing between the toes (two towelling pads are included with the toe washer). Pad size 95 x 125mm (33/4 x 5").